Tip Calculator free download for Symbian s60 3rd and 5th edition. 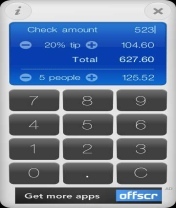 � Summary: Tip Calculator for Symbian s60 5th edition helps you to easily caculate everyone's share of your restaurant bill. 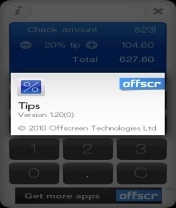 Tip Calculator for Symbian s60 5th edition helps you to easily calculate everyone's share of your restaurant bill! Just enter the total amount, the tip percentage and the number of guests. Did this calc working on nokia n70? if it i will thank you.